Thailand. One of the coolest places in the world to visit -- and I'm not just saying that because of their beaches. Thailand is home to an impressive history, and boasts some gorgeous ruins for you to explore. 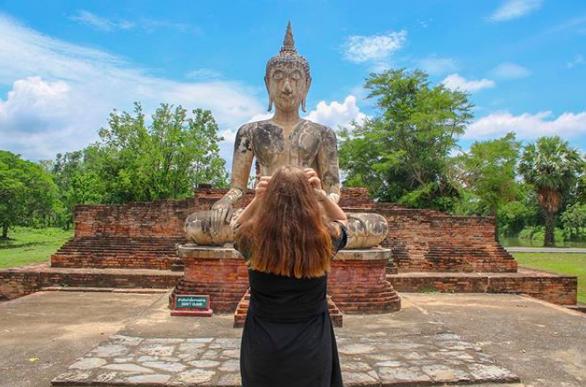 One ruin in particular that you're going to have to put on your bucket list is the Ayutthaya Ruins. I've got all the tips and tricks to make your visit that much better. You may also be interested in our ultimate Thailand destination guide. 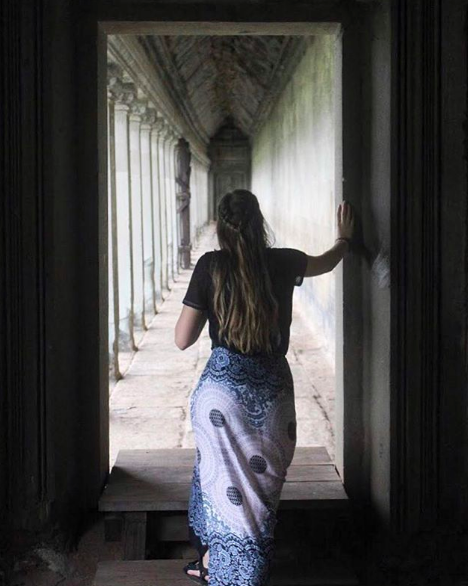 No matter where you're going in Thailand, this guide has the details! 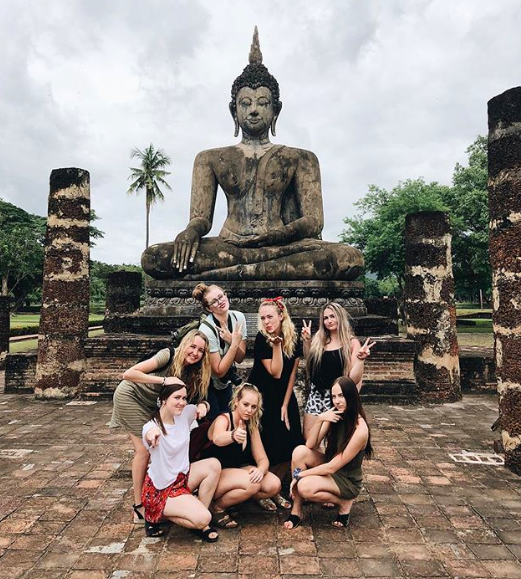 What Are The Ayutthaya Ruins? Time for a bit of history. Sukhothai (we also love the Sukhothai Ruins BTW) was the first Siamese capital of Thailand and was founded in 1238. 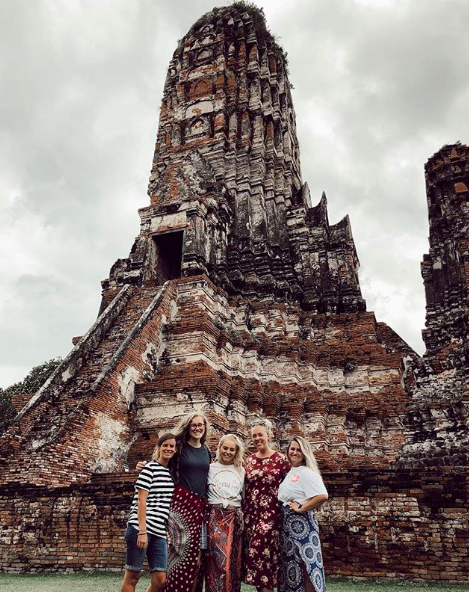 After the city of Ayutthaya was founded and because it was a thriving city, it took over as the capital and remained the capital for 400 years. Because the city acted as an extensive trading port with those from Europe, this was the place to be for hundreds of years. The demise of the city happened in 1767 when the Burmese attacked and left the city in ruins. Much of the city was devastated by fire and those that were not killed in the attack were taken and forced into slavery. Most of the city was destroyed, but what was left is still standing today. 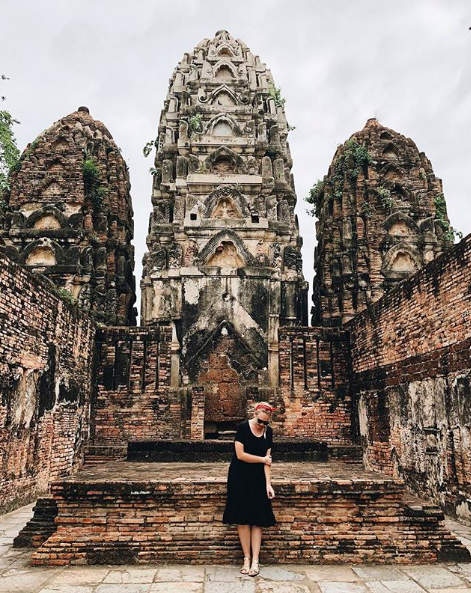 The Auytthaya Ruins are about 50 miles north of Bangkok in the city of Ayutthaya. It's located on an island surrounded by three rivers where the old capital use to be. It's the perfect day trip to add to your weekend itinerary in Bangkok. You will have a few different options on getting to the Auytthaya Ruins Historical Park. First and foremost, you will need to make your way to the city of Ayutthaya from Bangkok. Your options are either by bus, minivan or train. If you opt in to travel by bus, you will need to go to the Mo Chit Northern Bus Terminal in Bangkok. At this terminal, you will be able to board buses heading to Auytthaya from 5:00 am - 7:00 pm. The buses come every 30 minutes to an hour and there is a daily schedule posted at the bus terminal. The trip will be around 60 Baht (about $2ish) and the trip on a bus will be anywhere from an hour and a half to two hours depending on how many stops the bus has to take along the way. You will need to get off on the Naresuan Road stop. If you've been to Thailand, you've seen these little public minivans around. It's a typical minivan that you can purchase a seat in (most have up to nine seats in them) and they don't stop as much as buses do, so you'll get there quicker and it's a little more comfortable than the buses. You can get a minivan at the same bus terminal in Bangkok (Mo Chit Northern Terminal) and they leave every hour between 7:00 am and 5:00 pm. NOTE: While it's not usually an issue, the minivans will not depart until the van is full, so you could sit there a while before heading out. This is why many people prefer the bus over the vans. The ride will take about an hour to and an hour and a half and will be about 90-120 Baht ($3-4). Get off on the Naresuan Road stop! The most popular and cheapest way -- but not the quickest--to get from Bangkok to Ayutthaya is by train (this is the way I would go)! There are two different trains you can chose from: Normal and Express. The normal train is going to be the cheapest option at only 15 Baht for a third class seat (that's like 50 cents) and people love it because it's the most scenic route. However, the train will take about two hours to get there. The trains leave on a very regular basis (about every hour), but delays are common. The express train will only take about an hour and fifteen minutes and are air conditioned, but these trains do not leave as often and cost a little more (20 Baht for third class seats). To go by train, you will need to go to Bangkok’s Hua Lamphong Station and you will need to get off at the Ayutthaya Station. NOTE: Make sure you purchase tickets from the counter! People will stand outside claiming to sell tickets -- DO NOT BUY TICKETS FROM THEM. Sometimes they're real (but more expensive) and others are just fake. Go directly to the counter to be safe. Also, there will be two different counters to buy tickets from. One is for same day travel and the other is for future days. Go to the one you need! Once you arrive in Ayutthaya, you will need to make your way to the park where the ruins are. To do this will depend on where you are in Ayutthaya. If you arrive by bus or minivan, grab a tuktuk, taxi or Uber to the park. It's really close and won't cost much. If you arrive by train, you will be a short walk away from the park and can easily get there by foot. Luckily for you and me, there is no entry fee to get into the actual park. However, if you want to enter the major temples around the park, you will be required to pay an entrance fee. All of the temples will be either 50 baht for less to enter (so just be prepared with a little cash). When you arrive, you will be able to select the temples you want to explore and pay for. I would recommend doing a few as it'll only cost you a couple of bucks. The historical park is open every day (Sunday - Saturday) from 8:30 AM - 5:00 PM. I would recommend getting there right when they open (because it is a lot cooler weather-wise at 8:30 AM than in the afternoon) and exploring until lunch time!. There are some great places right by the ruins you can grab some lunch. Then you can head back for as long as you want. You'll have a few options of how to explore the ruins: by foot, by bike or by tuk-tuk. The majority of the big temples/ruins that you will want to make sure you catch are all within a small area. If you don't want to spend any extra money, you can do the ruins by foot. Each of the main ones are within a few minutes walking of each other. My personal favorite and one I think everyone should do is rent a bike to explore the ruins. You will be able to explore more than just the main ones and you'll be able to just ride around and enjoy the views of ruins. You can easily rent a bike for the full day on site (there's lot of bike rental places around the entrance) for only 40-100 baht (about $1.50-$4) depending on the rental place. If you want to feel like celebrity and get driven around the ruins, you can get a tuk-tuk at the entrance. The tuk-tuk driver will drive you to each of the ruins/temples and wait for you as you explore them. I don't personally recommend this just because half of the magic of the ruins are being able to explore them on your own and getting lost in the views. It's also quite a bit more expensive -- depending on your bartering skills, you should pay around 250 Baht per person or 1,000 Baht per day. One last thing to remember is that these ruins are a sacred place to Buddhists. You will need to keep this in mind and be respectful while you are visiting. 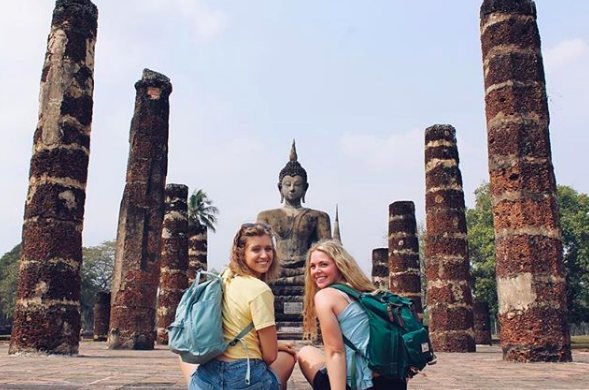 Be respectful of all images and statues of Buddha and do not climb on any of them, follow all dress codes for entering a temple (cover your shoulders, wear long pants/skirts or have a cover for both) and remove shoes before entering any building/temple. Be quiet when you're near sacred spots. 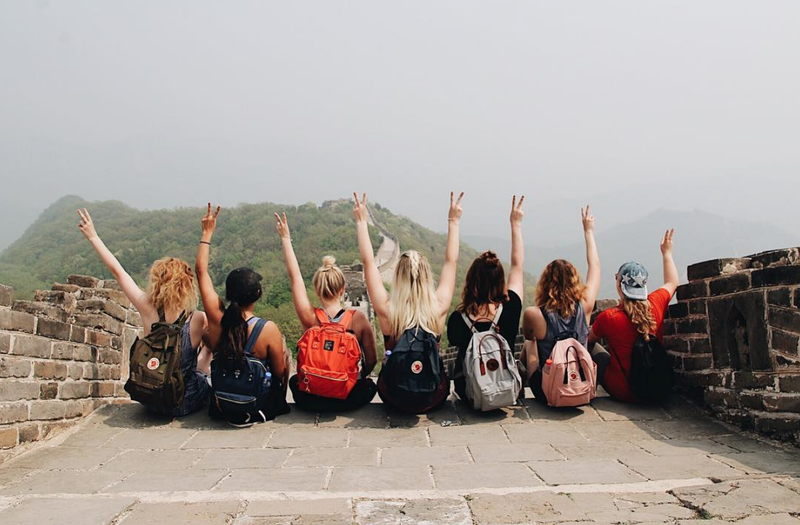 We think you're a perfect fit for a semester abroad. 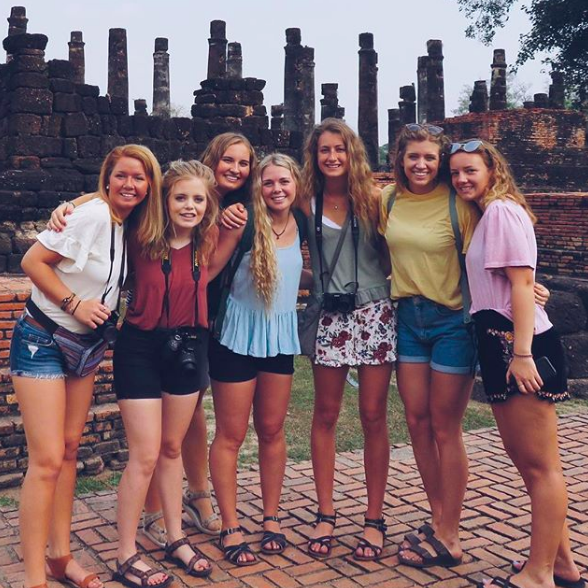 If you want to learn more about Thailand or volunteering with ILP there, click that button below!